I haven't written any Phillies updates because I know it'll put you foolios right to sleep, but here I come bearing pictures of hot men in the hopes of distracting you long to enough to school you on the goings on in the sports world. 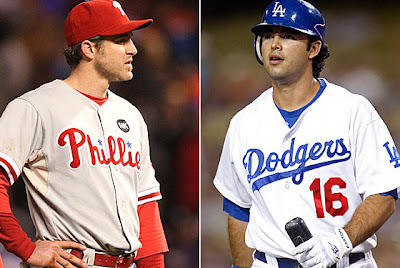 And last night the Dodgers got their rear ends handed to them lovely when the Phillies swept Game 3 winning 11 to 0. Zilch. Zip. Nada. ¡Ay, que pela! Oddly enough, Dad (a Dodgers fan when the Mets don't make it) has been pretty quiet throughout the series. Maybe he learned from last year? Game 4 is currently in play and right now it's tied at the end of the 4th. I'll return with the final score later! I must admit I am not that big into baseball.. but I like sports enough that I read the whole thing :) Always good to know what is going on in the world. Emmy, trust me. Your life will be that much richer for it. Sorry, I know you're Phillies fan. Hey, I can appreciate a good-looking man when I see one - regardless of whether he's on a losing team or whatnot. :) You keep up this interest....soon we'll be switching you over to different sports. The winter ones are fast upon us....football already in full swing and basketball on the heels. Nice try, Toojie. Baseball is the only one I can bear to watch. Well that and some March Madness. I was rooting for the Dodgers, but Congratulations to the Phillies and I hope they win the world series.